Seventeen Nalanda Masters — seventeen great Indian panditas who were associated with Nalanda monastery. At this time, when the whole world has witnessed tremendous advancement in the fields of science and technology, but we are also greatly distracted by the hustle and bustle of our hectic lives, it is crucially important for all of us who follow the Buddha to develop faith based upon an understanding of the Buddha’s Dharma teachings. Therefore we should investigate them, by analyzing and inquiring with an unbiased and inquisitive mind. 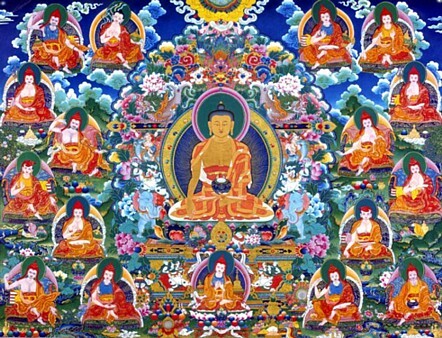 If we are to develop this faith that is supported by understanding, the outstanding works of the profound and vast traditions composed by the masters universally renowned as the ‘Six Ornaments and Two Supreme Ones’, as well as others such as Buddhapalita and Arya Vimuktisena are indispensable. With this in mind, I commissioned the painting of a thangka depicting seventeen of the most learned and accomplished masters of Nalanda, adding nine other masters from the profound and the vast lineages to the traditional thangka arrangement for the Six Ornaments and Two Supreme Ones. This page was last edited on 25 June 2016, at 17:07.